Re-engineering Husqvarna Blue Bird Bed Bug would be a relatively inexpensive process considering it‘s already $2000.00 + price tag. Adding strength and support to the blade. Increase the size and length of the Drive Shaft and the support Bearings. Add 360-degree support to the outboard bearing. Build the drive shaft hub assembly as a single machined or welded part. Increase the size of the Hardware and drill 3/8th in holes for 3/8th in bolts instead of 3/8th inch holes for 5/16th in bolts. For less then a $100.00 and 3 or 4 hours on my workbench I could triple the life of the Blade Support and Blade mounting. However, because of Product Liability issues My Insurance Company prevents me from altering the Husqvarna Blue Bird design. I have been dealing with this company’s lack of support and lack of understanding of the Rental Industry and our needs. From Judy Kerr on down I have not found a single person who takes Engineering, Safety or the Rental Industry seriously. I spent considerable time on this posting I hope it helps. The Blade Mounting assembly on a Husqvarna Blue Bird Bed Bug is at best sloppy tolerances are so loose that it is impossible to hold the blade steady. Husqvarna Blue Bird uses two small setscrews to attach the Blade Hub to the drive Shaft. In reality, the setscrews only lightly hold the blade on until the machine is started. After the Machine is running and in use it is only Luck and centrifugal force that holds the blade in place. The 5-piece Hub and Drive Shaft assembly consists of a ¾” Shaft, Hub a ¼-inch square key and two set screws this is a single part on most other brands of Bed Edger’s. The Husqvarna Blue Bird design could have been more reliable if the parts would have been built with some precession. The Shaft is undersize and the Hub is oversized out of the package, wobble starts day one, and gets worse with use. This part is in serious need for a redesign if for no other reason than Safety. Holding the Blade and Shaft assembly to the frame of the machine is the job of two undersize bearings and ½ of a bearing support on the outboard bearing. The Blade is 4” wide 16” in diameter and weighs 8 pounds has minimal support. Instead of 360-degree support for the outside, bearing the Bearing plate supports the bearing on two sides 90 degrees apart. This Bearing Mount is a sight of frequent failures. It will loosen up because of the oversize Mounting Holes and the Bearing Mounting plate frequently breaks. At one time, we welded and reinforced this plate currently; we just keep several in Stock at all times. The job of the debris cover is to direct the ground contain rocks and because of the Blade Breakage Issues contain chunks of broken blades. One would think with the importance of this part care would be taken in its manufacture. I would suggest that heavier steel should be used however; we have never had an issue with the steel being punctured. The issue with this part is that the mounting flanges are only tack welded. I have noticed on the 2013 machines the welding seams have been increased. Husqvarna Blue Bird has had a major problem with Parts availability over the years. We are early in our season and our Parts room has sufficient quantity of Husqvarna Blue Bird parts for our equipment. In 2012, we had one Bed Bug out of service for 8 weeks because a wheel adjusting cable was out of stock. Blades are often out of Stock. A few years ago, both of my Bed Bugs were out of Service for weeks because of “Lost Blades” The Husqvarna Blue Bird Parts Manager could not find 60 blades his inventory showed in the warehouse. Husqvarna Blue Bird Bed Bug Engine and Clutch are Honda GX 160’s, with Gear Reduction and Centrifugal Clutch. The Honda Engine has sufficient power for this application however; we have had Clutch Gearbox Temperatures go high enough to melt the Plastic Gearbox Dipsticks. Husqvarna Blue Bird has recommended setting the high idle as high as 4000 rpm and as low as 3000 rpm. We have tried both with no alleviation of the problem. 4000rpm would make sense except we feel this would be a danger with the Catastrophic Blade Failures of this machine. A Honda Service Rep feels the Bed Bug is the wrong application for the clutch on the GX 160 However engineering is beyond his expertise. Currently we set the high idle rpm’s at 3600 rpm + - 100 rpm. We will not change rpm’s until Husqvarna Engineers publish a Service Bulletin saying otherwise. While the Dipsticks continue to melt, we have never had a Honda Clutch failure or fire. We have submitted no less then six blades to Husqvarna Blue Bird for inspection. I have submitted pictures including pictures of my other Brand of Bed Edger and its Blade design. I have personally handed a blade to Jody Kerr who is considered the top Manager of the Blue Bird division. In one shipment I paid $50.00 to send blades directly to Blue Bird Engineers for inspection, we have also submitted blades to Husqvarna Blue Bird Distributors. The only answer I ever received was from a Husqvarna Blue Bird Service Rep who said the Machine was not designed to be used in the Rental Industry. That was 5 years ago and Husqvarna Blue Bird still Market the same machine to the Rental Industry. The Dog Fence Installer Blades have two types of failures one is bending of the blade. The Bending does not appear to be caused by hitting rocks. It appears to be a failure cause by building Blades from backing plates that are too thin and too soft for the application. We are finding slight bending of the blades on almost every rental. The second and more serious problem is the tips tearing off the Blades. With Dog Fence Blades, we find most cracks during our post Rental Inspection. We had one instance that a customer had a tip completely separate from the Blade. This was a failure that the Safety enclosure failed to contain. During the 2012, Rental Show a new style Blade was on display in the Husqvarna Blue Bird Booth. It was a heaver built blade and this was supposed to eliminate Blade Failures. (Bluebird has never acknowledged anything other than I am the only customer that has ever had Blade failures) I ordered a few of them however, I was shipped the old style blades. At the 2013 Rental Show I was told the new style Blades would not be shipped until the supply of old blades was exhausted. The Husqvarna Bed Bug suffers from low quality undersized components, and sloppy workmanship. Some of the issues are blades that explode to a point that even the safety shroud dose not always contain the broken chunks. The blade is supported by undersized components that are not designed to take the abuse of a tool that engages the ground. In trying to get answers to fixes for the frequent breakdowns, I have contacted Husqvarna Sales and Service Rep’s, Blue Bird Engineers, and met with a Rep from the Company that manufactures the Blades for Husqvarna Blue Bird. I find Husqvarna Blue Bird is a wasteland with no answers, ignorance, and a total disregard for Safety and reliability of the equipment it produces. The most costly and serious problem with the Bed Bug are Blade Failures. These breaks in the blade seem to be caused by undersized blade material. We do not see these failures on our other Bed Edger’s. Cleaning and closely inspecting blades now occurs on every rental, because this is not a failure that can be gauged by wear or hours of use. We have seen catastrophic failures on brand new Blades during there first use. Failures of the Bed Edger Blades are the Carbide tips tearing out of the blade blank. All failures are the same ½ moon tear my picture shows. A blade failure causes a vibration that our Customers tend to ignore until the safety cover vibrates off. We have been a customer of Blue Bird since the early 1960’s. Blue Bird Manufactured Automobile Engine Hoists and Engine Repair Stands that we used in our Shop and our Rental Business. 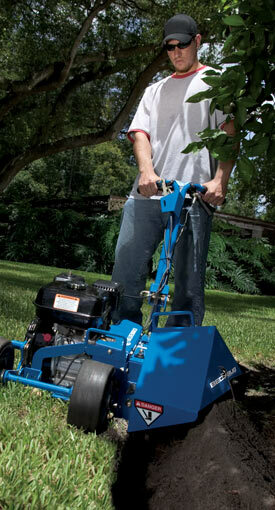 Blue Bird added powered Lawn Equipment to there line and we were expecting the same quality that we were accustomed too. The first lawn renovation machines held up very well however, the Aerators, Sod Cutters were plagued by failures caused by undersize Chains, Idlers, and Bearings. The Blue Bird Company was purchased by Husqvarna and this seemed to bring on a complete failure of quality, customer service, and parts availability. We rent the Husqvarna Blue Bird Bed Bug. The Bed Bug cuts Landscape beds it also is used to install underground Dog Fence Wire. It has been a very popular Rental Item. The Bed Bug is easy to use, and compact. The Bed Bug draws customers past other rental stores because customers prefer to use the Bed Bug to other Brands. Before you go out and buy some, the Husqvarna Blue Bird “Bed Bugs” it is a good design poorly engineered and constructed.